My name is David. I'm a young black and white dutch bunny. The vet thinks I'm about 1 years old. I'm was turned in with my brothers by our former care taker. He didn't take very good care of us since we had 20 abscess between the three of us! Fortunately, we were rescued and given proper vet care. We are fully heal and ready to find our forever homes. We can be adopted separately ( My brother is Bailey). Despite my past, I'm a very sweet bunny. I don't cause any trouble per my foster mother. I like to play hide-and-seek and I like to play peek-a-boo I see you. Sometimes I'm shy like I'm asking you to give a little more to our friendship and other times I'm all your's ( especially if you have a tasty snack!). My nose and ears are little scarred up from my past experiences, but that just gives me character and adds to my tough-bunny appearance. 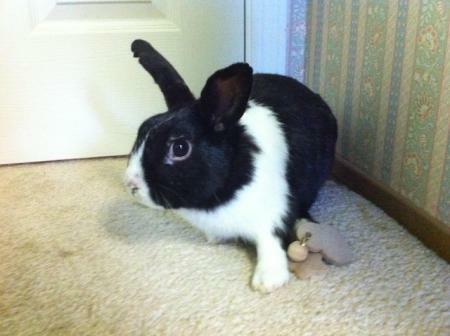 I may look tough, but I'm a soft hearted bunny who is just looking for my human family. I'm looking forward to being loved and cared for by my future best human friend. Update - I've been bonded to a diva bunny named Sparkles. She pretty and shiny white with lovely lavendar and ruby eyes. She has some problems seeing up close so when she's excited about food you should make sure she knows the difference between the greens and you. She's is a love though so stole my heart as I'm sure she'll steal your's! Thank you SaveABunny for posting me on your website. If you are interested in adopting me check out www.PAWSforSJACS.org, click "resources" and then "courtesy adoption listings" in the drop down menu. Thanks for considering a rescued rabbit and saving a life! Please promote spaying and neutering of pets to avoid overcrowding and euthanasia in shelters.